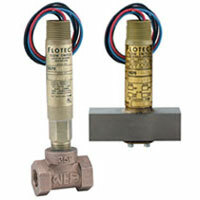 Dwyer's flow products included in this category are compact and explosion-proof. They monitor liquid, gas, and air flows. Some applications are control dampers according to flow, signals alarm, shuts down burner, and protects pumps, motors, and other equipment against low or no flow. What material is used as a seal between the process fluid and the electrical portion of the switch? The body material; as there is no separate "seal" since the body is machined from solid stock and the switch is magnetically actuated. 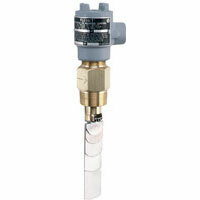 What is the pressure drop across a V6 Flow switch? Pressure drop (head loss) is a function of both set point and flow rate. Typically, pressure drop at actuation flow rate listed will be 5 – 10 PSID (0.34 – 0.69 Bar). 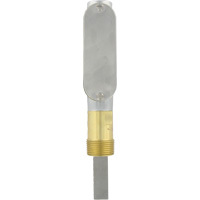 Pressure drops at other flow rates will vary in proportion to the change in flow. Are custom vanes for the V6 available? Yes, we can supply customer vanes for the V6. The information we would require is as follows: pipe size, flow direction (horizontal, up, down), mounting, pressure, temperature, specific gravity, flow rates (maximum normal, actuation/de-actuation). 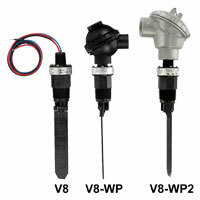 Please see custom vane option in the online configurator. Why should a customer be discouraged from buying a V6 without a tee and installing it in his own tees? Two reasons: One, the customer will frequently tighten the body in the tee one turn too many, resulting in the vane hitting the tee. This bends the vane and it can jam up even after the switch is backed out one turn to its proper position. Two, there is also a wide variation in tee dimensions between manufacturers which aggravates the problem.